The lifting force is produced by the main rotor . As they spin in the air and produced the lift. Each blade produces an equal share of the lifting force. The weight of a helicopter is divided evenly between the rotor blades on the main rotor system. If a helicopter weight 4000 lbs and it has two blades, then each blade must be able to support 2000 lbs.In addition to the static weight of helicopter ,each blade must be accept dynamic load as well . For example, if a helicopter pull up in a 1.5 g manouver (1.5 time the gravity force), then the effective weight of helicopter will be 1.5 time of static helicopter weight or 6000 lbs. due to gravitational pull. The tail rotor is very important. If you spin a rotor with an engine, the rotor will rotate,but the engine and helicopter body will tend to rotate in opposite direction to the rotor. This is called Torque reaction. Newton's third law of motion states , " to every action there is an equal and opposite reaction" . The tail rotor is used to compensates for this torque and hold the helicopter straight. 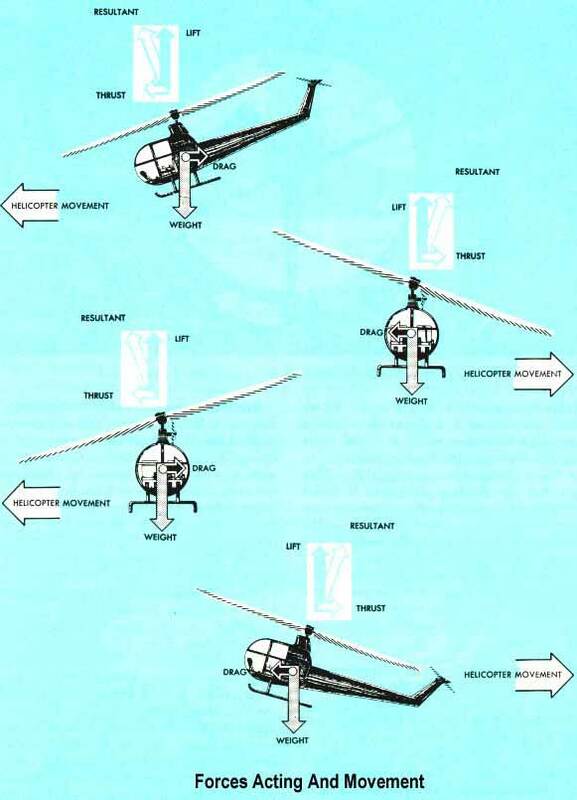 On twin-rotors helicopter , the rotors spin in opposite directions, so their reactions cancel each other. The tail rotor in normally linked to the main rotor via a system of driveshafts and gearboxes , that means if you turn the main rotor , the tail rotor is also turn.Most helicopter have a ratio of 3:1 to 6:1 . That is, if main rotor turn one rotation , the tail rotor will turn 3 revelutions (for 3:1)or 6 revolutions (for 6:1). In most helicopter the engine turns a shaft that connected to an input quill in the transmission gearbox. the main rotor mast out to the top and tail rotor drive shafts out to the tail from the tranmission gear box. 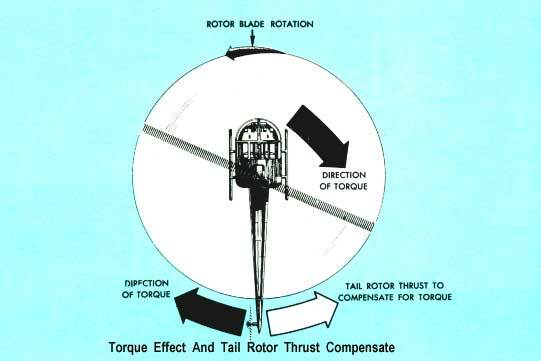 All rotor systems are subject to Dissymmetry of Lift in forward flight . At a hover , the lift is equal across the entire rotor disk . As the helicopter gain air speed , the advanceing blade develops greater lift because of the increased airspeed and the retreating blade will produce less lift , this will cause the helicopter to roll (for example: if rotor speed = 400 km/hr , helicopter move forward=100 km/hr then advancing blade will have speed=500 km/hr but the retreating blade will has moving speed of only 300 kr/hr ) . This has to be compensated for in some way . Dissymmetry of lift is compensated for by Blade flapping. Because of the increased airspeed and lift on the advancing blade will cause the blade to flap up and decreasing the angle of attack . The decreased lift on the retreating blade will cause the blade to flap down and increasing the angle of attack . The combination of decreased angle of attack on the advancing blade and increased angle of attack on the retreating blade through blade flapping action tends to equalize the lift over the two halves of the rotor disc. The swash plate assembly consists of two primary elements through which the rotor mast passes. One element is a disc, linked to the cyclic pitch control. This disc is capable of tilting in any direction but does not rotate as the rotor rotates. 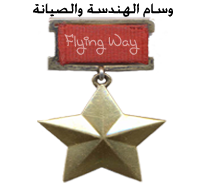 This non-rotating disc, often refered to as the Stationary Star is attached by a bearing surface to a second disc, often refered to as the Rotating Star which turns with rotor and linked to the rotor blade pitch horns. When pilot raises the collective control or pull collective control up , the collective control will raises the entire swash plate assembly as a unit . This has effect to the blades by changing the pitch of all blades simultaneously .This causes to increase angle of attack and give more lift. The cyclic control will push one side of the swashplate assembly up or down. This has the effect to the rotor head system because the cyclic control or cyclic stick controls the angle of the main rotor by angling the rotor head to which all the blades are attached .This cause the helicopter to move left or right, forward or backward. 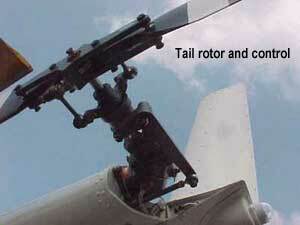 The Thrust produced by the auxiliary (tail) rotor is governed by the position of anti torque pedals. These are not rudder pedals, although they are in the same place as rudder pedals on an airplane. They are linked to a pitch change mechanism in the tail rotor gear box to permit the pilot to increase the pitch of the tail rotor blades. The primary purpose of the tail rotor and its controls is to counteract the torque effect of the main rotor. لكن لو حبذا تحط الشرح باللغة العربية ليكون اسهل لأغلب الأخوة لفهمه..